I picked up the Friday-Ad for the first time in donkey's years while house sitting in the countryside near Cuckfield, and came across a little Ad for a vintage fair in Lindfield, Village Vintage. Held in the quaint King Edward Hall in Lindfield, I didn't really know what to expect. I've not seen it advertised elsewhere, and it proved to be a little gem of a secret. The hall was rammed full of stalls and it was a bit of a push to get round everything, fighting through the crowds. This crowd, however, were a little different. Gone were the hordes of 20 somethings, the trendies looking for that Maxi dress no one else will have, replaced by a buzzing crowd of collectors, and a vast majority of yummy mummy's. A very different crowd indeed. But this made for a different collection of stalls too, lots of habidashery, baby clothes, and homeware, with a few clothes stalls wedged in between. A lovely tea room serving home made cakes, and banners hanging from the walls! ﻿I drooled over many a glamorous frock, having to pass them over as I'm on a very tight Budget right now, but I couldn't pass these by. This red and gold striped dress. The lady who sold it to me told me this used to be her Aunts. A very stylish Aunt indeed! and a snip at £12! Also found a bag and some gloves to go with the dress I have now finally finished. I'm waiting for the weather to improve a little, and then I'll wear the whole outfit to take some pics. Quite excited actually! 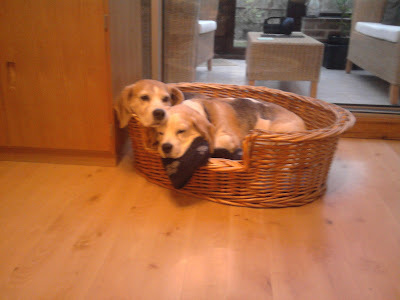 In other News, the Mister and I had the pleasure of looking after the Beagles, and also popping in on the parents place. The Beagles look rather happy in my dog's old basket, although it was a bit of a squish!